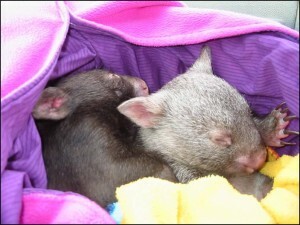 Baby wombats are with their mother for the first 16-18 mths, so a buddy can make a big difference. At around six months of age and approximately 1 to 1.5 kgs your joey will start to emerge from the pouch. 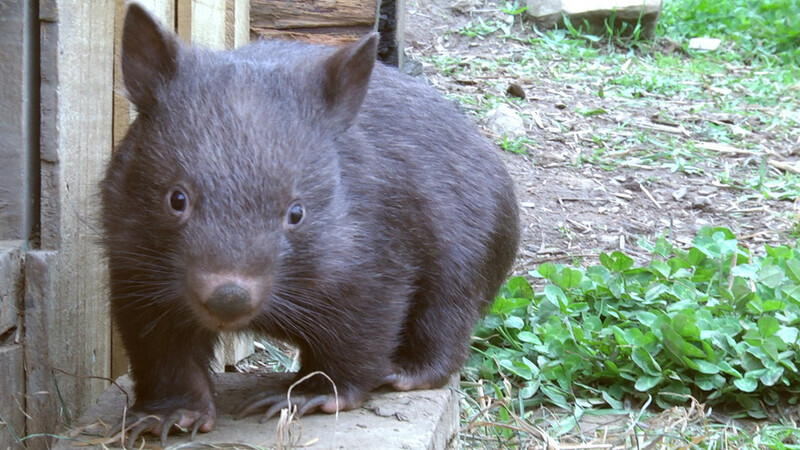 This is the time to start thinking about a buddy, another wombat of a similar size. At this early stage they tend to accept a buddy very readily. Two or even three joeys of similar size are easier to raise than a single joey. A wombat joey on it’s own wants your undivided attention just as it would with its mother. For the first 6 months the joey is carried around in the mothers pouch, then it will gradually emerge but needs the comfort and reassurance of its mother at all times. This is when it learns wombat protocol and behaviour. The first few times the joey emerges from the pouch is in the safety of the burrow where it will climb all over mum having fun and games. Wombat mothers and babies communicate with a special soft (huff, huff) which seems to say “here I am”, “where are you” “wait for me”. A louder sharp sound is made by both mum and joey if there is any fear or danger nearby. 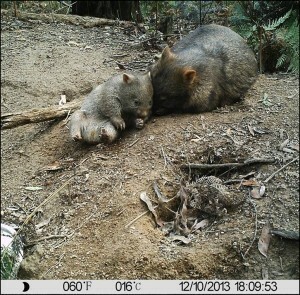 As the joey gains confidence and is spending more time out of the pouch the mother wombat will sometimes leave the joey on its own in the safety of the burrow. During this time the mother will go off and seems to enjoy some well earned time out. As with anything new this step needs to be done gradually to avoid stress. Hang their pouches side by side in the same pen/cot so they will hear, smell and feel each other. 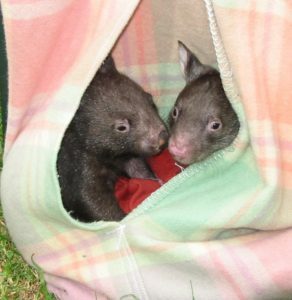 Leave the wombats in separate bags until they choose to share. This way they have the security of their own bag to retreat to if things become overwhelming. Introduce new buddies during day light hours when they are fairly sleepy, this makes it easier for you to keep an eye on what is happening. 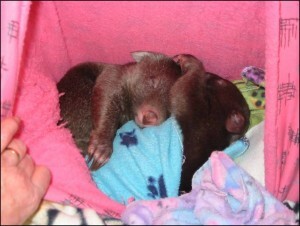 Soon they will enjoy another wombat to snuggle up to and it’s not long before they will be romping and playing together. 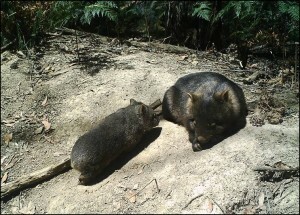 Most combinations will work but it is not advisable to pair two male wombats with one female. As the wombats grow, a pair of boisterous males can become too rough for a single female. 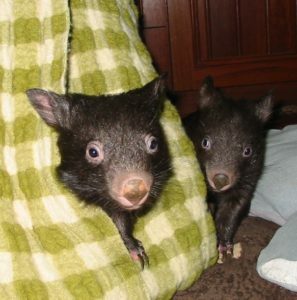 Each wombat has it’s own personality and this is something you will have to gauge for yourself. 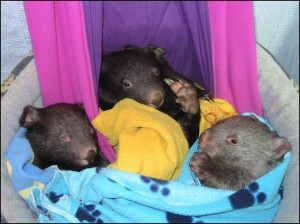 A buddy enables the orphans to bond and learn they are wombats. 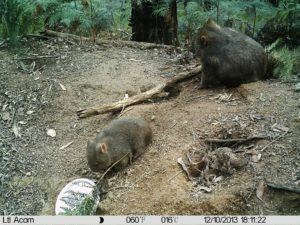 The company of a buddy allows the carer to step back as the joeys will rely on each other for company, confidence, security and wombat behavior. This is the start of the human separation stage. Once a wombat has a buddy they can be brought up together almost through to release. Sometimes one of the wombats may mature earlier than the other and this may cause problems, usually not until around 18 – 20 months of age. You may notice fighting and fur loss on the rump of one of the wombats. 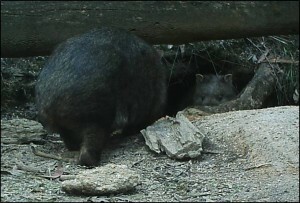 The more mature wombat may no longer want to share the burrow and if this is the case it may be necessary to separate them. Sometimes this behavior will resolve itself over a couple of weeks. Keep an eye on the situation to ensure their isn’t too much stress for the less dominant wombat.